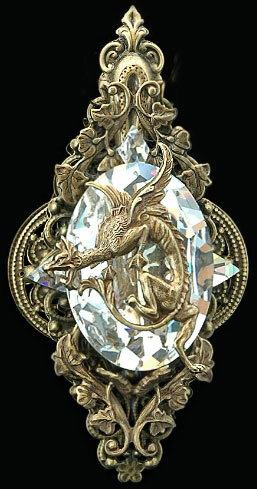 My Majestic Griffin rests atop a huge Swarovski clear crystal stone while guarding this fabulous treasure. His elegant image is reflected inside this amazing stone. Surrounding him are small Swarovski crystals and layers of delicately etched antiqued gold brass filigree. This piece doubles as a brooch or a necklace. Just attach your favorite chain to the back tiny loops.